I don't know what the weather is like in your neck of the woods today, but this is what we woke up to this morning. The same thing I'm thinking. I love the names your hubby drew and Pepper and Polly are ADORABLE!! I can't believe all of your snow...WOW. Contratulations to April! Pepper and Polly - they just "fit". You're right, Paula - stupid groundhog. We had our big snow THursday and Friday, and I'm so glad it's gone, altho it was beautiful! We set some records down here in Texas. Wierd weather we're having this year! I like the new names. Congrats to the winner. It is so cold here today. Just a few miles up the road they are having a blizzard so I guess I'll stop complaining.I could be in that part of the state. I agree with Edie. Stupid groundhog!!! Congrats to April and I love the names Polly & Pepper - what cuties! Paula, your snow scene is just beautiful. We finally have a little sunshine today after a few days of snow here in GA. Hope you enjoy the week. YIPPEE!!!! I won your giveaway??? I am in complete shock, but I'm so very excited! Thank you so much, Paula! I think Pepper and Polly are a perfect match! :) We got lots of snow here, too...wasn't it just GORGEOUS? 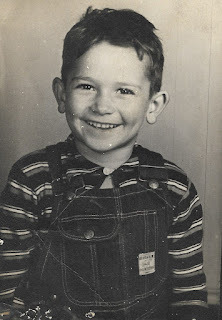 Have a great day, Paula...I know I sure will! Cute names and cute contest; congrats to the winner! We're in midst of another snow storm, need to go batten down some hatches. What CUTE Names!!! And they just seem to "fit"!! Happy day sweetie and congratulations to the winner!! Pepper and Polly is so cute!! Congrats to the winner! We have more snow here~I'm tired of it! We got snow over the weekend (about 6 or 7 inches). But most of it is gone now. Temps were pushing 50 today. Pepper and Polly are great names. Congrats to April. we had another storm yesterday. we are so tired of snow. it is beautiful and covers a multitude of uglies but enough is enough! Hope your snow melts soon....I'm so looking forward to spring and I do start mine vicariously through you Southerners! Perfect names! Naming animals is so much fun because you can use all the names you love and their personalities take them on! 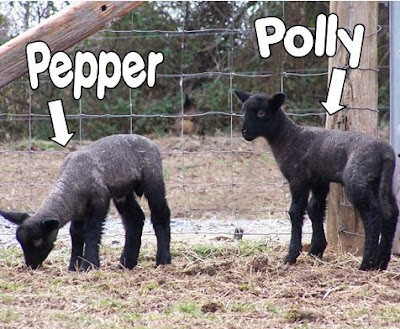 Pepper and Polly will be happy little lambs with names like that! Spring is coming...the snow will go and you will have the best grass ever!! Snow and it's nutrients brighten the greens! What's up with that groundhog? I'm thinking he was woke up too early...I get grouchy like that too when someone wakes me up! Love the new names! Congrats to April! Pepper and Polly are wonderful names. We got 7 inches of snow last week and now it's all gone. We were out of town in western VA over the weekend and I am glad we are home. They are calling for more snow over there. While driving through the mountains we saw a ton of snow and deer. It was magical! Those are great names! There's sure been lots of snow everywhere but here. It's looking and feeling like Spring now. Congrats to the winner! Pepper and Polly are cute names! I think we are all hating Mr Groundhog!!! Congratulations April! Great names! The snow pics are beautiful! But, I agree about the groundhog, lol! Great names! And wonderful pictures again, too. (as always!) How are your bees handling all this snow and cold? I guess they hibernate, right? Congratulations to April! Pepper and Polly re so cute and it should be fun to call them! Our chickens are different breeds, we don't even know what a couple of them are! I went with a list of which kind were supposed to be the friendliest, but the man we bought them from was just getting started in the business and doesn't know much about them. 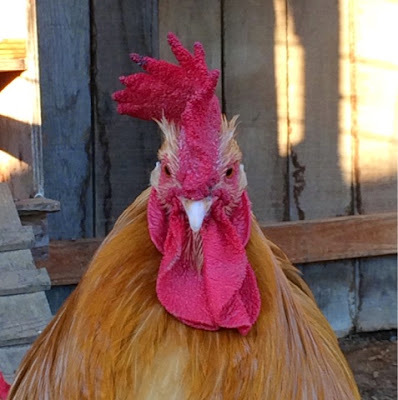 He may have even given us a rooster or two!?!? We're not sure exactly how we'll know until one (or more) of them crow. We've put Annie back in with the girls and it's okay except for one (she/it's usually been sweet) but Betty (or Bert?) is raising a ruckus and we had to separate her/him? All's still not well in their coop. But I've noticed that the Aracauna's are the toughest ones! That beak trim sounds interesting but I wouldn't know how on earth to accomplish it. Ouch! Thank you for the advice - I KNOW I'm going to need more! Hope you don't mind? I like the names too! They look like a Pepper and a Polly. Hey Girl! I just love those little lamb faces! Their names fit them so nicely and Rowdy must love having frends to play with! I have got to get up there to see you soon! Geeezzz..how did I miss out on this..darn!!!!!!!!! Well..congratulations to the winner and Pepper and Polly are adorable names!!! We've a very snowy day here today....SOOO beautiful..it's coming down heavy and steady! Cute! Pepper and Polly~ I love it!!! Great names! Easy and catchy, congratulations to the winner. And isn't it wonderful your husband chose names that ARE easy to say and remember! This looks like a Romney; is it? I love that Roman nose! I sure do love the names "Pepper and Polly." What adorable sheep. The snow is very pretty, too. Have a great week. Pepper and Polly are such cute names!! We came thru easatern TN on Monday, coming back from Nashville. We took the 'short cut' thru Newport, TN into Hot Springs, NC. That is one curvy road but it is beautiful thru there. Thankfully the road was clear. Yep, I think the same of the groundhog. The groundhog is now on our least favorite person list! I've had enough snow for the next 2 years! Great names! I adore your snow pictures - we haven't got snow here this year and I miss it!